Levels and Curves and a bit of deguassian blur. Looks likeyou are right and I did miss one. This is a great picture. It's a favorite now. That bokeh is just superb! Wonderful image! It certainly should do well in the fair competition. Good Luck! What a beautiful shot! I'm not sure how I missed faving this one, but I will now. Absolutely wonderful! I found it interesting that even @ 1/1600 Tv the wings still show motion; great job. Just enough motion any more it would have been too much - anyless and you end up with a static image. I don't quite get the name, but gorgeus photo. This is just great! Congrats on your top 10! i really love the softness of it. congrats on your top 10! Big bokeh. Great capture. Congratulations on your top ten finish. one of my favs :), congrats on top 10! This is not an easy shot to pull off at all. Not only did you nail the bird perfectly, but there is great bokeh and the exposure on the flowers is spot-on. Nicely done! Tough photo to get... but very well accomplished. Nice job! Great capture on the right moment, wonderful soft colours and good lighting. Excellent! 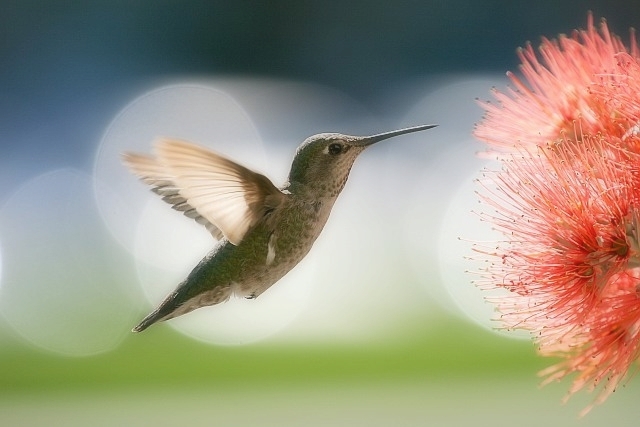 One of my favorite Hummingbird photographs of all time. Your DOF, composition, and focus is perfect! First page winner! That is a "beyond belief" hummingbird photo. I love the way the light forms circles behind the bird in the background. The color of the flower is lovely, and the bird is incredibly sharp. .especially realizing how fast it is moving. You really got a great capture here! The large white,dreamy artifacts add a lot to this ethereal shot. Makes it real special. I like it. Great capture! Beside the big lense you used, I wonder how you did it. great decision shooting this one :) I don't think I could make it so sharp as yours! Beautiful, what a great capture. Wow, this is grewat. What an awesome capture. I know ths took some patience. I love the soft colors in the background and the mimosa blooms. Beautiful soft details in wings. Just wonderful!! Only because I won't give out a 10...Wow! Great job. It's not easy getting shots of these little guys. Wonderful shot of the Hummer - the detail is astounding. Great job! Wish I could vote - I would give this one a TEN!! Proudly hosted by Sargasso Networks. Current Server Time: 04/21/2019 02:45:39 AM EDT.